A big above ground or inground swimming pool gives you or whoever, the ability to get this remote control pool skimmer going faster. Therefore, it’s much more fun to skim the leaves and debris from any pool. It really doesn’t matter if your pool is above ground or a regular inground pool. In order to keep your pool a Safe and Stress-Free place for the family to gather, you need to make sure it’s clean. That being said, you might as well have fun and enjoy the task of skimming the pool surface. is one of the best gadgets for cleaning the leaves and debris from any pool. Providing fun and making the task of cleaning the pool much more enjoyable. Kids and adults both will anxiously wait for their turn to operate this pool skimmer. 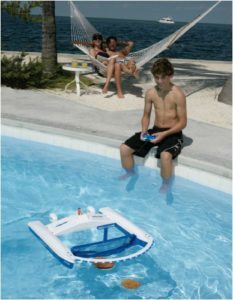 Powered by a heavy duty rechargeable NI-MH battery (battery & charger included), Your kids will love cleaning the pool. The batteries will last a surprisingly long time and the radio has a range of up to 100 feet. This makes it great for pools and small ponds.